Summary: Obsessed with breaking a world record, Lee McGillicuddy makes attempts on several different records unsuccessfully. After the latest attempt gives him sunstroke, Lee remains more determined than ever, forcing himself to walk the Manitoba Marathon, a thirty-five kilometre journey. Despite his failures, Lee is hopeful, until he comes to the abrupt realisation that some people are born talented as opposed to having to work to put their names in the record books. He becomes discouraged, but encouragement from his friend Rhonda (call me Ron) ends up leading to a situation that will test his endurance and prove the character traits he possesses are record-breaking in their own right. 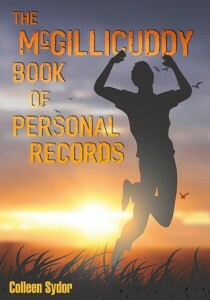 Review: With shades of a PG version of A Prayer of Owen Meany by John Irving, The McGillicuddy Book of Personal Records by Colleen Sydor features Lee McGillicuddy, a teen who stumbles upon heroism after training to break a world record. Lee is determined to conquer his body and in the process demonstrates characteristics of strength, single-mindedness and perseverance. Though he does not achieve his goal of making a world record, he saves the life of his friend Rhonda instead, making a name for himself as a hero and proving his fortitude. Constantly seeking to improve himself, Lee collects quotes to motivate him and help him figure out the nature of life. He comes to see himself as the star of his own movie, being directed from above, though at first he sees it as a pretty boring tale. Except even before he saved Rhonda, he was always the hero of his own story by being a great kid. The voice of Santiago, Lee’s dog, was for me the best part of the book. It’s authentic, funny and endearing, and I loved how Santiago plays such a crucial role in Lee’s life as his friend and companion. Sydor truly captures his innocence and continual enthusiasm as he blossoms under just a bit of attention. Great character. Sydor’s book lies at the very edge of teen, probably better suited for pre-teen, but Lee himself is thirteen. At times I thought he could have been older with his knowledge of The Old Man and the Sea by Ernest Hemingway, but his friendship with Rhonda and infatuation with Charlotte place him firmly in early teens. The McGillicuddy Book of Personal Records by Colleen Sydor is published by Red Deer Press, (2010).